It's been freezing cold outside! A big bowl of steaming homemade soup for dinner sounds great. On Thursday, that was my thought process in the afternoon. So that's what we had for dinner- a hearty hot bowl of soup! Most of the ingredients were, well, leftovers from another dinner. On Wednesday the family was in town. It was a FuN time! After Wednesday's dinner there were many slices of oven baked barbecued Chicken remaining on the serving dish. There was also a small amount of mashed potatoes. One other food we always have whenever they are in is Kraft Mac and Cheese. I'm not sure how, but yes, there was a bit remaining, too. Nothing else. As I was deciding what to prepare for dinner, the happy memories of Wednesday reminded me that we did have a few leftovers in the fridge. This could be the start of a hearty soup on a cold winter night. And it was! It did not take long for me to combine Chicken Broth with about 1/2 Cup of Mashed Potatoes in a small soup pot. About 1 Cup of frozen Mixed Veggies were add to the mixture along with dehydrated Onion, Parsley and also Basil. After cooking the vegetables in the broth mixture for 11 minutes, about 1 Cup of cooked Chicken chunks were added and stirred in. Then about 1/2 Cup of the prepared Kraft Mac and Cheese. To make this soup a little creamier, I added in 1/2 Cup of Milk. What a delicious soup! The macaroni that was coated with cheese gave the soup a great taste. I wanted it a little creamier, so I added in 1/2 Cup of Milk. WoW! 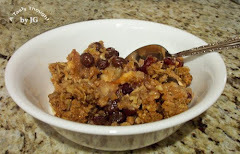 This very tasty hearty soup was prepared mostly from leftovers. Who would have guessed that soup would be on the menu the following night? 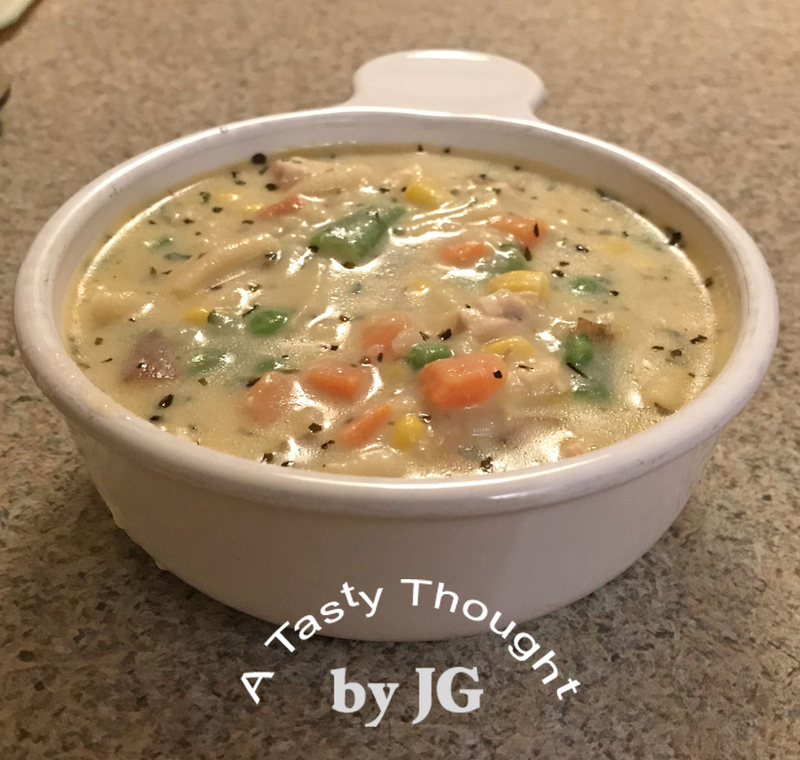 Soup that was prepared with, well, foods that were just waiting in the fridge! So good! In a small Dutch Oven/ Soup Pot combine Chicken Broth with Mashed Potatoes. Add frozen Mixed Vegetables, Parsley, Onion & Basil. Cook for 11 Minutes or until vegetables are done. Add cooked Chicken chunks and Kraft Mac & Cheese. Stir. Add 1/2 Cup Milk and stir. Soup will be creamier. Heat another 4- 5 Minutes. A bowl of this hot soup tasted so good on that cold night! 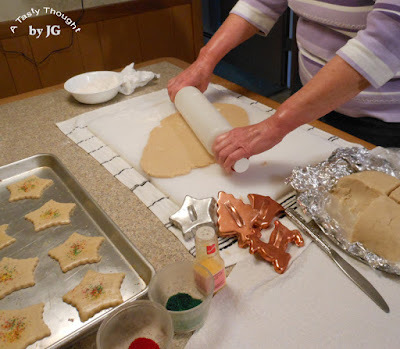 Today I made the batter for my traditional Christmas Cookies! They are just so good. For years I've baked these cookies. Well, the years all add up to over 40 years, now. The dough contains a hint of nutmeg and also sour cream. As I write this, the double wrapped cookie batter is in the fridge. These cookies are not only "just the best", they are an easy 2 day process. On Day 1 the dough is prepared and refrigerated. Then, on Day 2 a rolling pin, mat and cookie cutters are given a workout. On baking day find your colored sugars for decorating. ***I always use unsalted Butter when preparing the dough. The dough is much easier to roll out when using Butter. There's always a little "taste test" going on after the first tray of these cookies have been taken out of the oven and they've cooled a bit. Most of the batch will be packaged/ labelled and frozen for next week. Yes, these cookies freeze very well. I usually also place 6 in a small Ziploc Freezer Bag to freeze. It's a great treat on a cold winter day to find this treasure in our freezer. This recipe makes about 5 dozen Best Ever Sour Cream Sugar Cookies. Click here for the recipe. 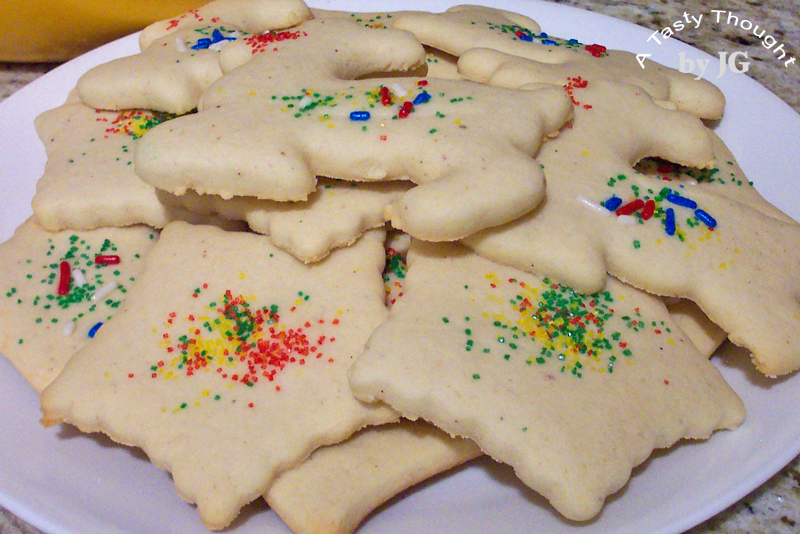 Look no more for a tasty sugar cookie recipe. This one has a hint of nutmeg and sour cream. 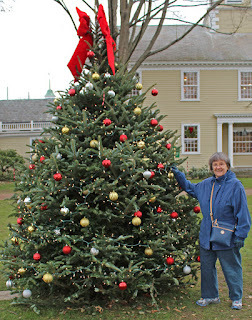 Just a quiet Saturday afternoon in New England on a December day! 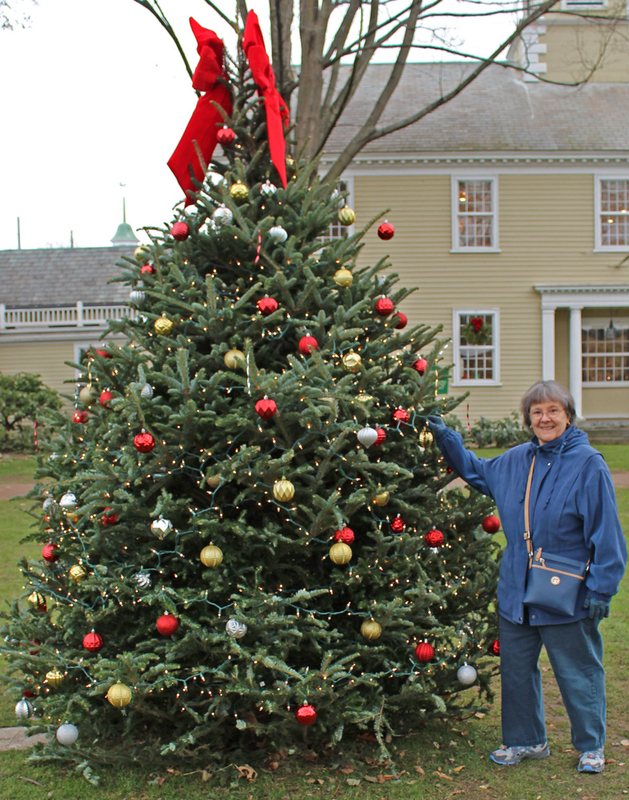 Admiring the beautiful Christmas Tree! 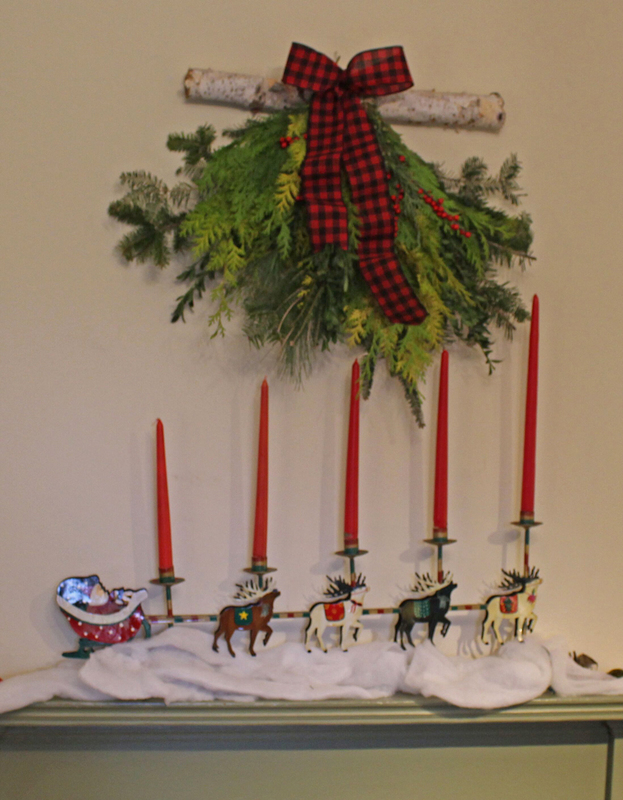 Yuletide at Storrowton is a great event in my area of Western MA! We went last weekend! The weather was co-operating, so we drove over the Connecticut River to West Springfield (in MA). 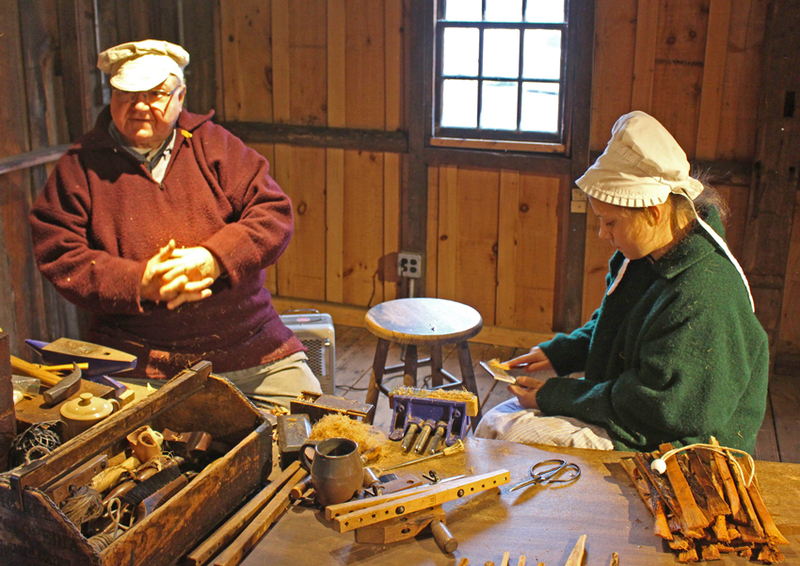 Walking onto the grounds of this 19th century New England village brings us back in time to a period of our American history when so many every day items were hand crafted. 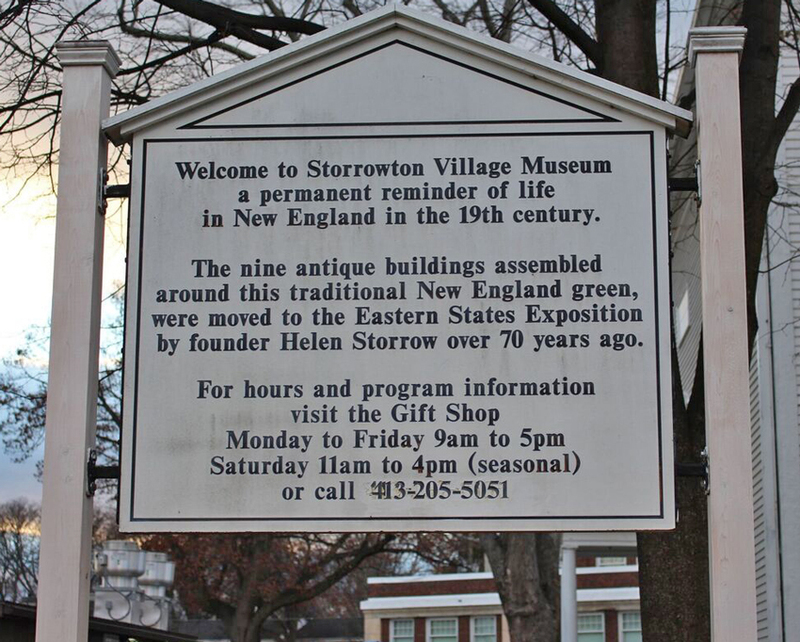 The buildings on the grounds are original and moved to their present location at Storrowton Village. 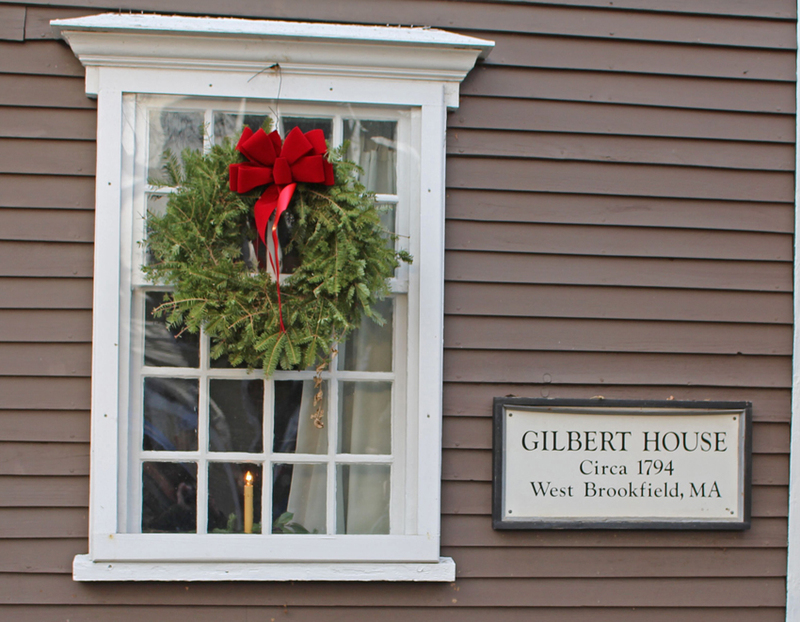 The Meeting House was our first stop! A Meeting House was used for Town Meetings and also for worship. It was our first stop! 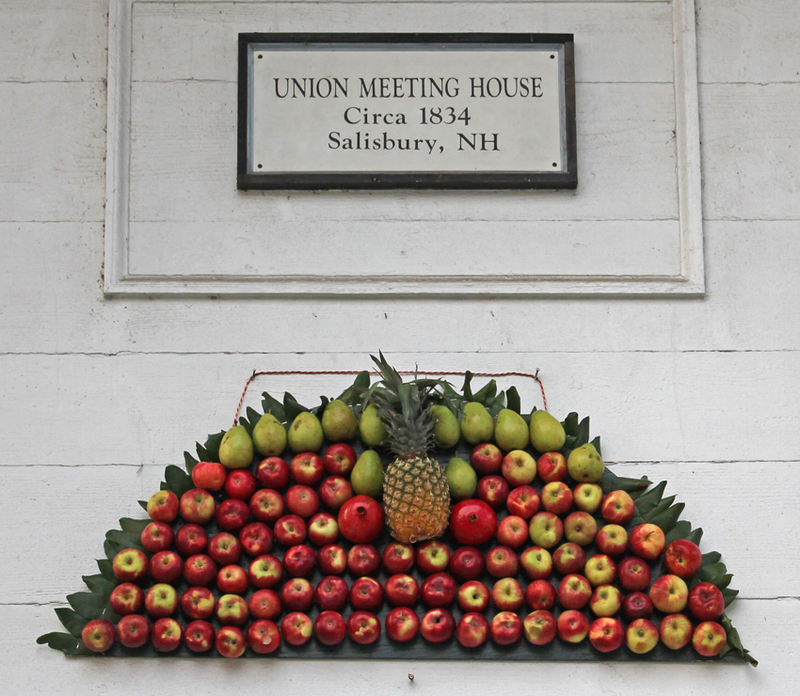 The fruit decoration above the doorway was beautiful and not often seen these days. 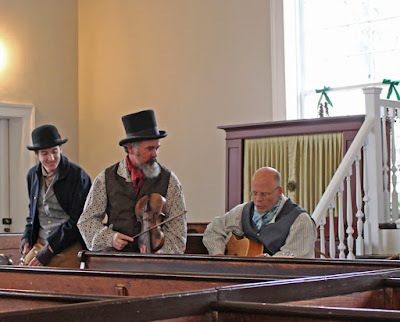 Once inside sitting down, we had the opportunity to listen to Folk Music from the 19th century! 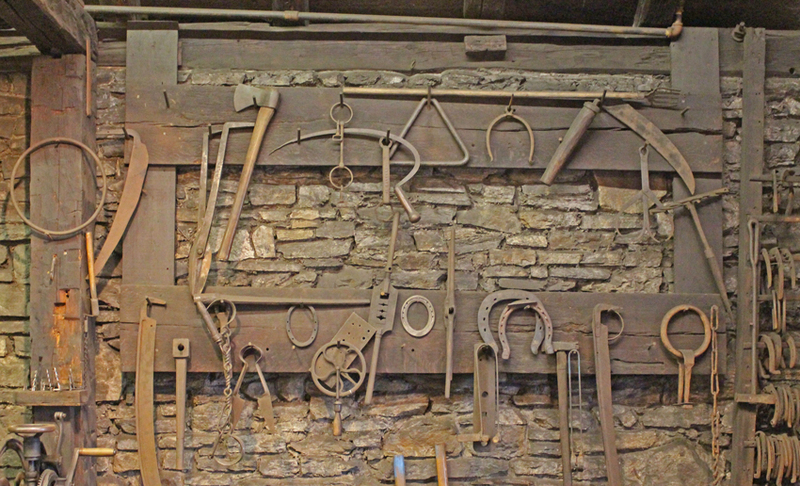 Then, onto the Blacksmith Shop! 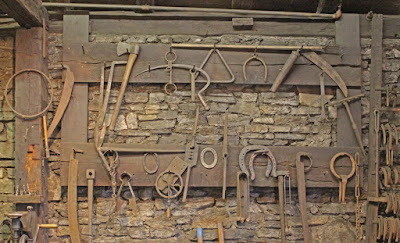 Needed tools the Blacksmith had crafted. He stopped his work to answer the numerous questions we all had. 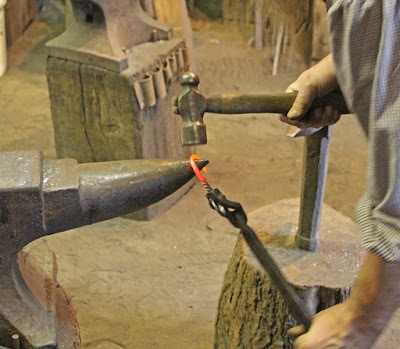 Pounding the red hot metal to a needed shape. 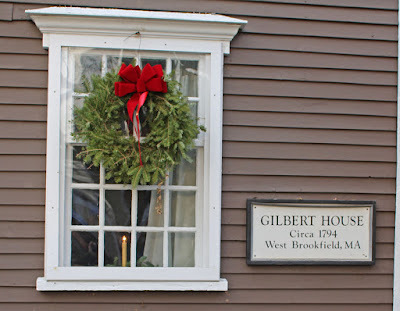 Walking a little further down the path, we visited the Gilbert House. There was a candle in the window! Once inside, we visited with a lady spinning yarn. The Kitchen was in the next room. Then, we enjoyed the Parlor. 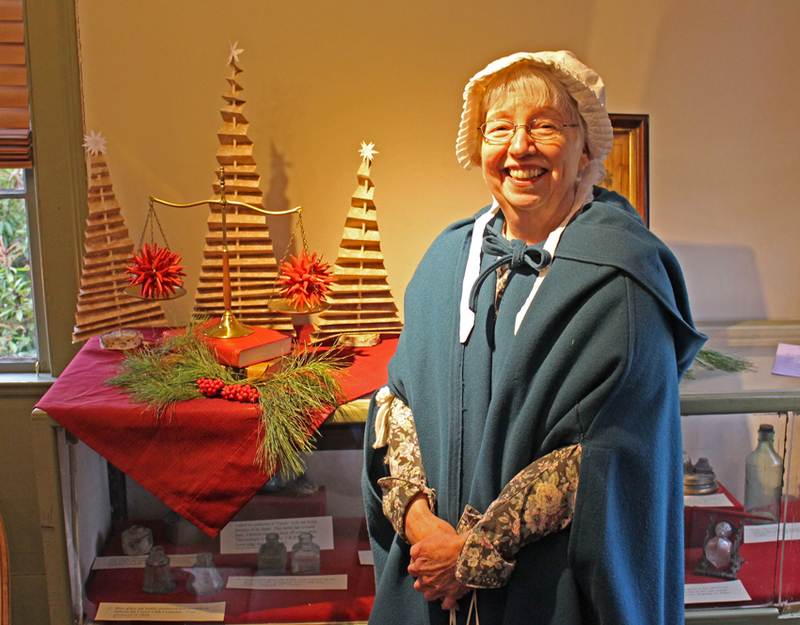 There were so many beautiful decorations to admire while visiting Storrowton Village! Once inside the Schoolhouse a gentleman described the education during this time period. 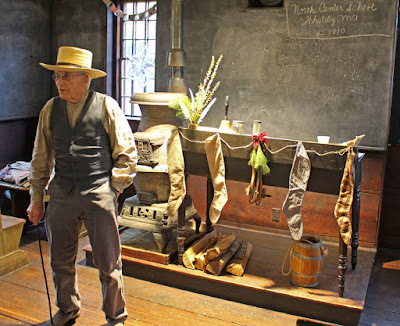 In this Schoolhouse the blackboard was on 3 walls. Our last stop on this wonderful journey back to the 19th century was to chat with a craftsman who made paint brushes. 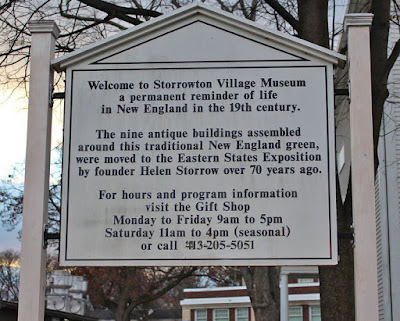 It's always fascinating to visit Storrowton Village! 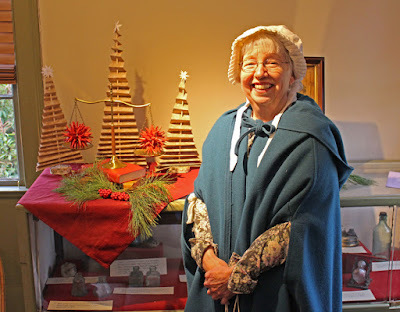 This week there are tours and special "Lantern Light Tours" of the Village taking place. This is an event we always put on our calendar! I know you have enjoyed this tour back to 19th century New England! 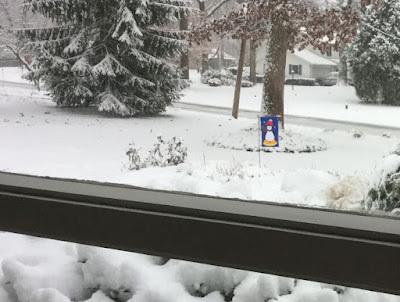 It's the beginning of December. You may have knitting needles in many sizes just waiting to be picked up and start clicking away. You may have white or blue, green or red yarn sitting in your "yarn stash". There may be even a skein of black yarn. If you don't have black yarn, put it on your "must buy" list! These adorable Penguins are just too cute to resist knitting, if you like to knit!!! 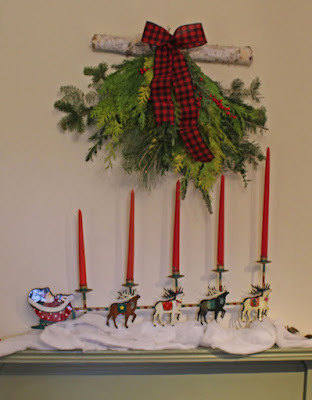 Last year I surprised my older two grandsons with these cute little guys. One grandson likes anything and everything relating to Penguins. I used a Red Heart yarn pattern that I had found on Twitter. JOANN's had the needed buttons to securely sew on the faces. Using a small piece of Bias Tape the buttons were sewn on much easier. They are also more secure! 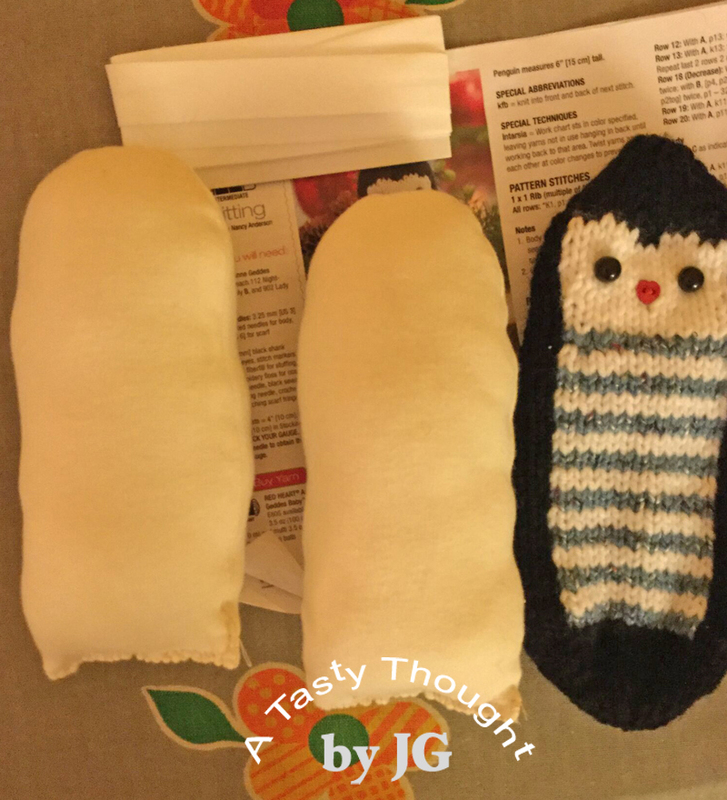 Each Penguin has a jersey body liner that's stuffed & then placed inside the knitted body. This body liner prevents any stuffing from seeping out of the knitted body. Stuffed Jersey Liner to place inside Penguin. The Penguin body is knitted. 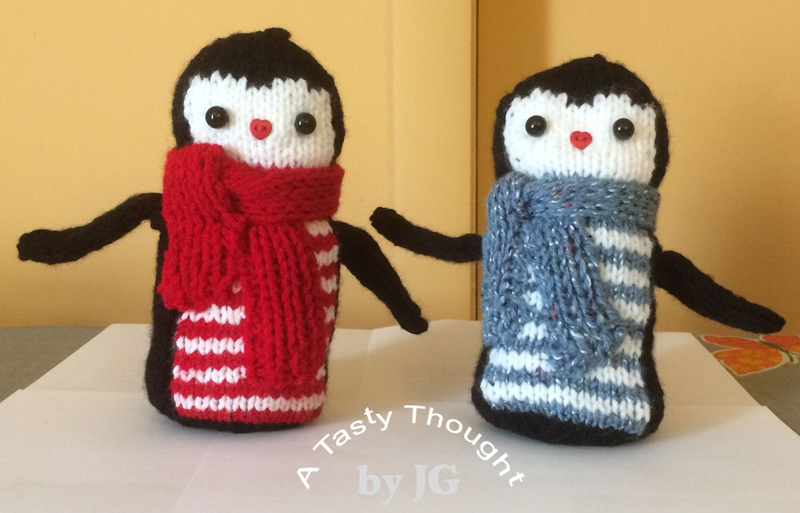 The flippers and scarves are knitted separately. I tacked the scarf onto the Penguin, completely, so it will never move. ***Push in the bottom of the completed Penguin, if you want it to stand up. 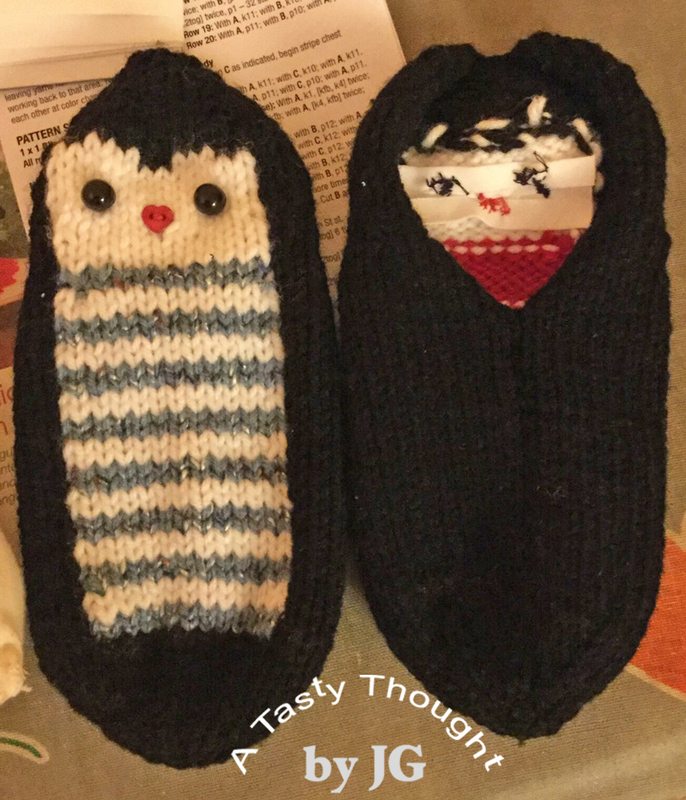 This amigurumi Penguin is a cute gift for some lucky recipient! For my complete post from last year on creating these adorable knitted Penguins, click here. These little amigurumi are just so cute!! !